Slice each bell pepper in half. Remove stem and seeds. Place pepper on sheet pan and bake for 10-12 minutes. While the peppers are roasting, heat oil in large heavy-duty pan over medium-high heat. When onion starts to brown, add ground meat. Crumble and stir meat for 2-3 minutes until brown. Add seasoning of your choice and stir for 2-3 minutes. Remove from heat. 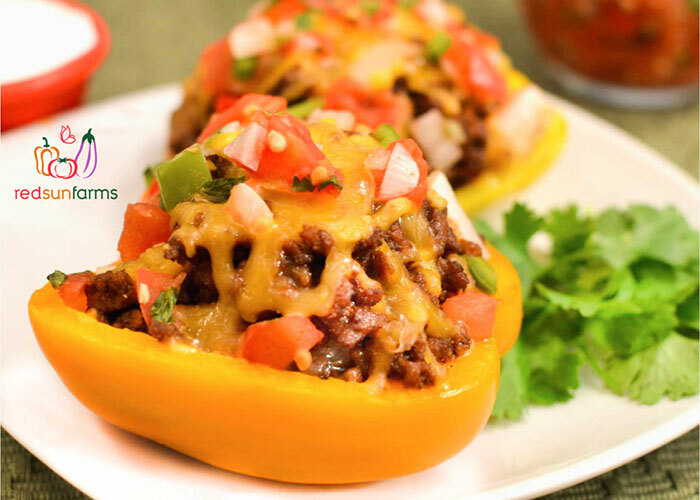 Fill each roasted bell pepper with about ½ cup of taco meat mixture (or until full). Sprinkle with cheese and return to oven to bake for 20 min or until cheese bubbles and is lightly browned. Remove from oven and top with lettuce, tomato, avocado, sour cream, cilantro and jalapeno, as desired.